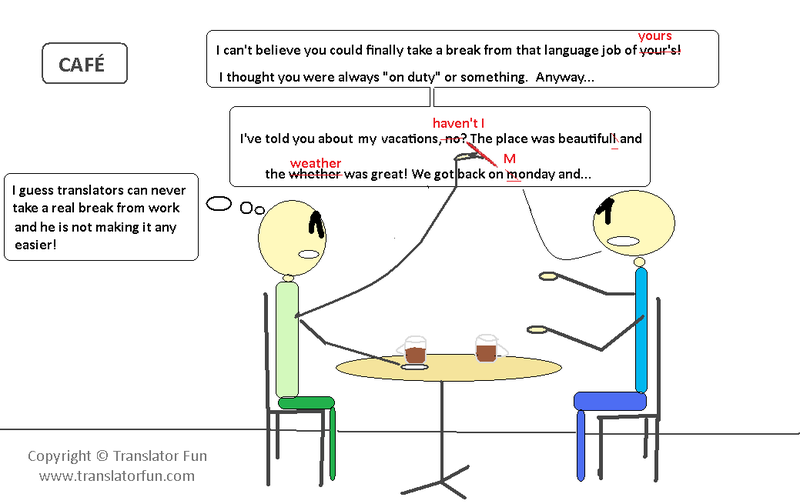 ‎”Being a language professional is a 24/7 job” Do you agree? Do you correct your friends’ grammar while they speak? Or do you simply make mental notes? This entry was posted in Freelance translator, Fun, language, lifestyle and tagged 24/7, grammar, spelling, translator by Romina Bona. Bookmark the permalink. I haven’t had any friends rolling their eyes at me yet, so I think I am still safe. . . I am only just beginning my training as a translator, but this is something that certainly rings true for me. I cannot help but tut at spelling mistakes and “typos” in printed literature. Ever since my passion for languages began I have pestered friends by pointing out their mistakes on social networking sites, instant messaging, or in speech. It’s good to know I’ll be fitting in well in this profession! children’s homework….! But, we really want to…!